Reconnect with Judaism’s most important contribution to humanity—and redeem our world. Reconnect with Judaism's most important contribution to humanity--and redeem our world. "The gift of Judaism is an understanding of what it means to be a human being--what we can do, what we can hope for, how we can live with purpose, what is expected of us. It is a celebration of human freedom, human possibility and human responsibility. Judaism is a way to live a heroic life, to construct a life devoted to values that are eternal, values of ultimate significance. The reward of a Jewish life is walking the world with a profound faith that you matter, your life matters, your dreams matter. I call this chutzpah." 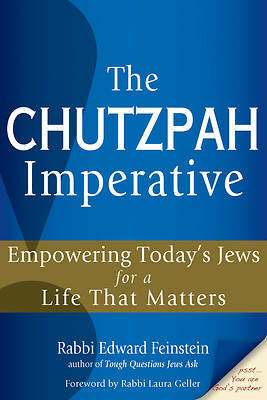 In this clarion call for a new way to "do Judaism," award-winning spiritual leader Rabbi Edward Feinstein urges us to recover this message of Jewish self-empowerment--or chutzpah--to reshape our world. He walks us through the history of chutzpah--from the early chapters of Genesis, Jewish biblical law and the Rabbis of the Talmud to the mystics of medieval Spain and the European Hasidic tradition, Zionism and post-Holocaust thought. By showing us the ever-presence of chutzpah in Judaism he reveals the inner story of the Jewish People's soul as well as the meaning that Judaism's deepest purpose and most precious treasure has for us today.